Regular readers here will probably have already realised that I have a bit of a thing for the stained glass windows created by artist Tom Denny. I had set myself a goal this year of arranging a tour to see a selection, but you won’t be surprised to know that I haven’t done that - yet. 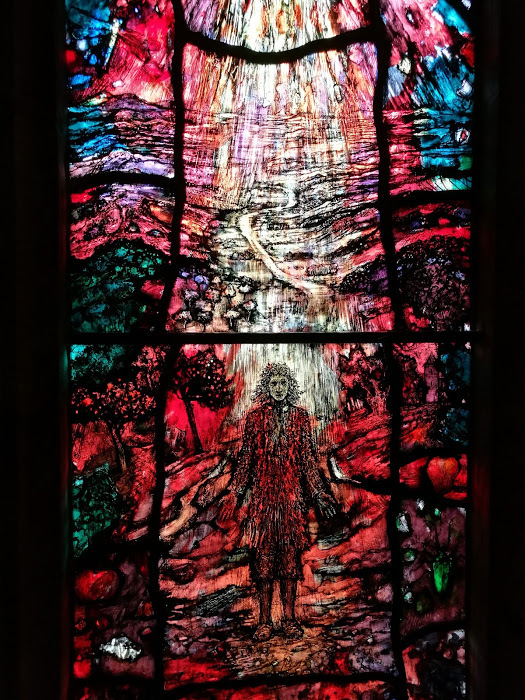 However, in July, I did manage to visit Hereford Cathedral where Tom Denny has four panels dedicated to the seventeenth century poet and priest, Thomas Traherne. Traherne’s writing, poems and meditations, are perhaps a forerunner of those of William Blake, mixed with the delight of nature you find in John Clare. Like most people, I’d never heard of Thomas Traherne until just a few years ago. In fact, the story of the discovery, or more accurately re-discovery of his work is only just short of a miracle - you can read about it here if you’re interested. My own awareness came in a suitably roundabout way, through reading the Merrily Watkins novels by Phil Rickman - (they’re set in Herefordshire and who will occasionally make reference to the work of Traherne, who was a Herefordshire man). 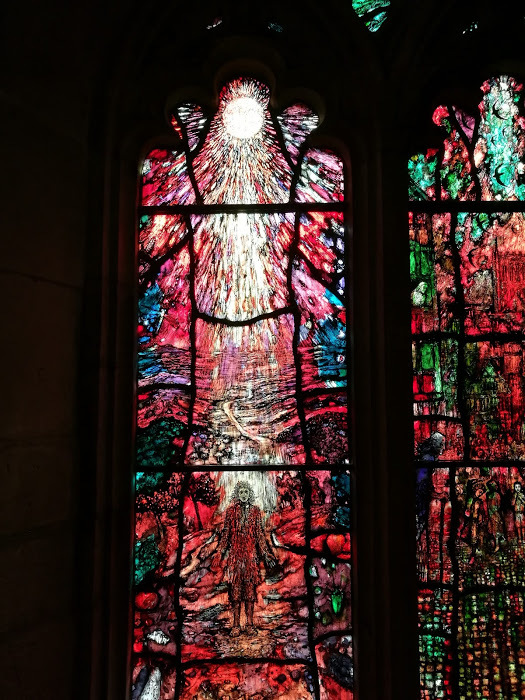 Anyway, I’d seen photographs of Tom Denny’s Traherne windows, and was excited to finally be in the cathedral with time to go and look at them. The first surprise though, was that I couldn’t find them. 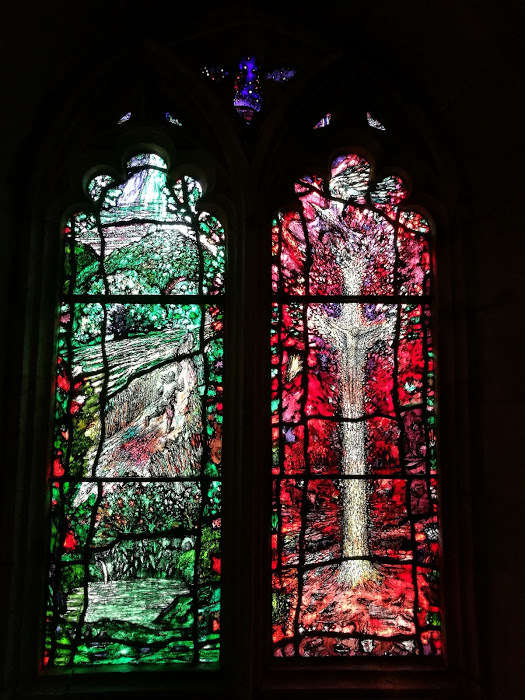 Tom Denny’s work is so unlike anything else I’ve come across in stained glass that I wasn’t anticipating any problem spotting the Traherne windows, but having walked a complete circuit of the cathedral, I hadn’t found them. Eventually, confused, I asked a cathedral guide if she could point me in the right direction. And it turns out that the windows are quite difficult to find, as they are actually in a tiny side chapel, the Audley Chapel, at the very far end of the cathedral. But oh were they worth the hunt. I was astonished to discover that they are actually quite small - something I hadn’t appreciated from the photos I’d seen. Small they may be, but despite that, they are crammed with the incredible details that are the signature of Denny’s work. And in the Audley Chapel, you’re able to get right up close to the windows, so you can really see and appreciate the details. Looking at them, I couldn’t stop myself from repeating out loud, ‘oh wow!’ - which seems like such an inarticulate response, but in fact they simply did take my breath away, I was literally awe-inspired. Now I’m not a stained glass artist, and despite being immensely attracted by the art form, I’ve never had any inclination to try working in this medium, so for me there remains something entirely magical about the way that light works through the colours, it’s magical because I have no idea how it’s created, I’m content to let it work on my senses without needing to understand the process. 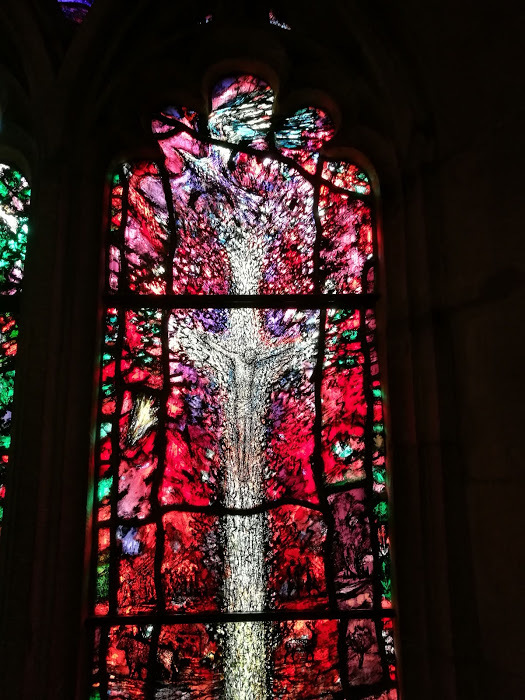 I have recently discovered a video which shows Tom Denny working on the windows he created for Leicester Cathedral, in which he describes some of his process. This is fascinating, but fortunately doesn’t dispel the enchantment for me. 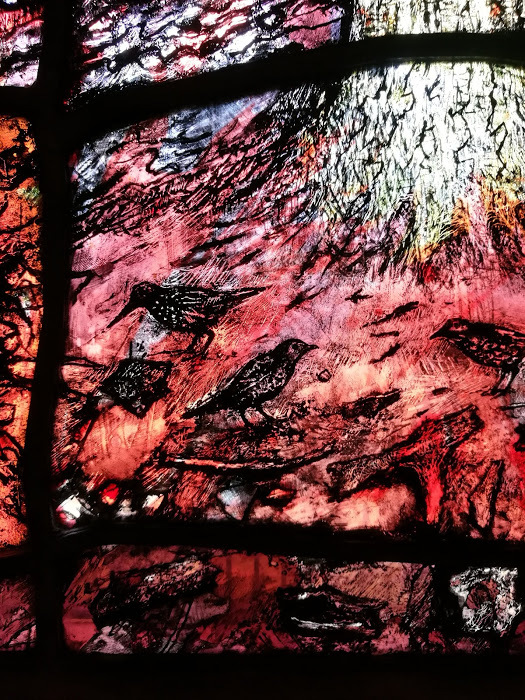 So I was able to stand in the tiny, dark chapel and be entirely overwhelmed by the play of colours, hidden images, light and shadow. I continue to find this medium deeply inspirational. Deeply moving. The intensity of the colours does something to my spirits, something that I can’t put into words, but which I feel on an inner level. I’m drawn into the images, I feel their richness, I want to soak myself in them, to absorb their light. Over and over, I try to recreate that feeling of light in the embroidery and fabric art that I make. I try to find ways to create the luminance with threads and fabric and to create that movement of light. It’s an on-going process of trial and error, but I always go back to stained glass and know that somewhere there I’ll find the answer, I just have to keep on trying.